Sharing files online isn’t that much easy as it should be, especially, if you have large files with size in GBs. Thankfully, we can use P2P (peer-to-peer) file sharing software to easily share files with anyone online of no matter what size. You can easily upload or download TBs of data without any restrictions. P2P file sharing software can be quite handy, but at the same time, they also have some negative points. These p2p file sharing software also host illegal downloads so that it may lead to any action against you. Furthermore, these peer to peer file sharing software are also known to spread viruses and malware; you will have to be careful about downloading too. There are dozens of P2P file sharing software to choose from, but it is essential to choose the best P2P file sharing software that is safe and features rich. To help you find the best file sharing software for your needs, we have compiled a list of best file sharing software. You can just select the one that seems right for your needs. Even after being acquired by BitTorrent.inc and becoming closed-sourced with ads, uTorrent is still the leader when it comes to P2P file sharing software. Although you need to subscribe for a premium membership to take full advantage of the client, even its free version offers all the required features to upload and download files without limitations. It has an extremely light client with a very intuitive interface, and there are no limits on how much large files you can upload or download. You will have to bear ads with the free version, but you can opt for a paid version to remove ads and get more features like the virus scan, instant streaming, and file conversion. Ares is a powerful open-source P2P file sharing software that is light and very feature rich. Like many advanced file sharing software, it offers fast downloading using more than one shared file. You can stream audio/video while download to preview them (a paid uTorrent feature), and also chat with other users who are sharing files online. The software is also very good at managing your files with dedicated categories, like documents, videos, images, and music, etc. You are also able to sort your files according to type and change preferences according to your requirement. It will also scan the files to ensure they are free from any malware. 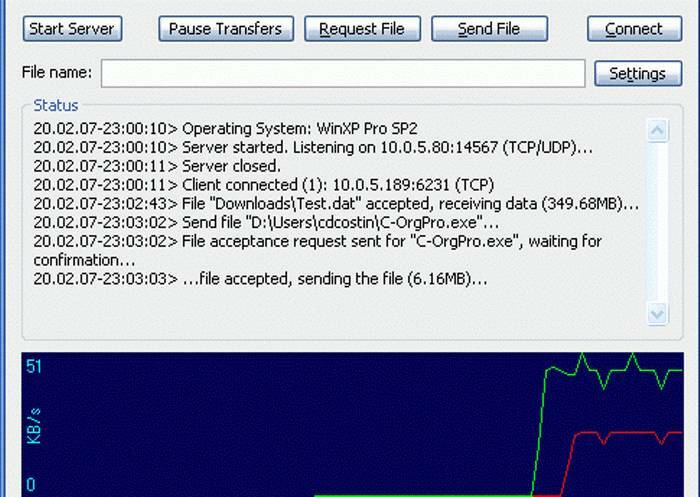 qBittorrent is an open-source P2P file sharing software that is created to replace uTorrent for people who still want open-source software. qBittorent has an interface similar to uTorrent, and many of its features are adopted from uTorrent. It lets you easily share files of any size and also manage uploaded and downloaded files. You will have full control over files being shared with the ability to prioritize files and set limiters. You can automatically download content, add filters, set up port forwarding and remotely control client. Extensions can also be added to increase functionality such as encryption, peer exchange, and Magnet URIs, etc. Vuze is another paid P2P file sharing software that offers loads of features has a free version with almost all the required features. It has two free versions, Leap (light) and Vuze (feature rich). Leap comes online with basic features like bundles, playback, and search, but it is very light on resources. Vuze offers all the advanced features such as torrent control, remote access, converter and plugin support. The free version of Vuze should be more than enough for most users, but you can opt for Vuze+ if you want more features. With Vuze+ you can burn DVDs right from the client, stream media, remove ads and scan files for malware. 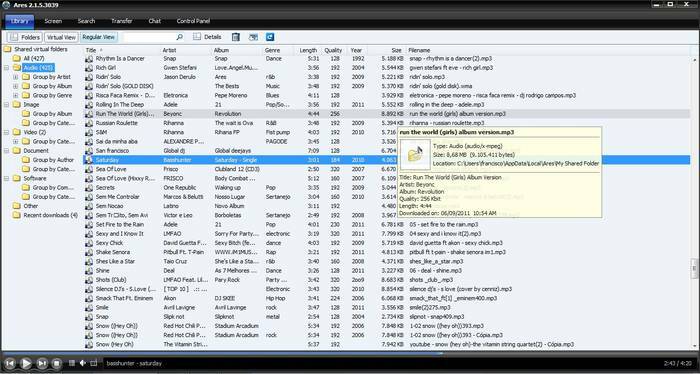 Deluge is another open-source file sharing and downloading client that offers optimum protection to your files. Deluge comes with the built-in encryption system that will encrypt all the files being downloaded and uploaded, offering complete protection to your files. The client itself can be protected with a password to ensure no one could access your data. You can share files privately, and its built-in encryption compliments private file sharing. It gives full control over files with the ability to set speed limiters for individual files. Some of its other features are, Web UI, Local Peer Discovery, proxy, bandwidth scheduler, Mainline DHT and plugin support. Another completely free P2P file sharing software with tons of advanced features. It has a really simple interface, making it perfect for people with less tech knowledge. However, behind its simple interface, it hides tons of advanced features that would be loved many users. It speeds up downloads to up five times by separately downloading different parts of the file. The files can also be streamed while downloading to preview them, and it also automatically renames the files. Its other features include Magnet URI, DHT network, Cross Protocol, Share torrents, speed limiter, and RSS tracking. With GigaTribe you don’t upload the file like with other P2P file sharing software; instead, you share files to view, and the receiver can choose which files to download. It is a private file sharing system where you can share files with up to 500 people for free. You will just create a username and invite people to your room where you have shared all your files. Other users can see the files in real-time, and then they can select which files to download without any limitations. You will have to be online to let other users download your files. You can also chat with other people while sharing files. Sharest is a P2P file sharing software that offers advanced features of standard torrent clients but focuses most on file sharing. It comes with “Share with friends” option to share files directly with friends. It has many advanced security features to protect your files from malware and viruses and also protect your connection with other users. Its other features include proxy support, BitTorrent integration, faster speed, control of shared data, firewall to firewall transfer and much more. File Transfer is a simple software that is only capable of creating a secure connection between two computers to share files of any size. It uses a direct P2P connection and requires a little bit of configuration before making a connection. The connection is encrypted, and the transfer speed is enhanced with NAT traversal protocol. The connection is stable, and even if one party goes offline, the transfer will start from the same point where it was left. Tixati is a simple yet powerful P2P file sharing client that uses advanced methods to share files within a simple interface. It has a very light client, but it is still capable of downloading files at high speed and encrypts both outgoing and incoming connections. It also holds other advanced features, such as Magnet URI, peer management, bandwidth management, NAT, RSS, IP filtering, and download scheduling. Sharing your data with other people is a common task and not always you will be able to use Flash storage device to share data. If you are looking to share large data online, then the above mentioned P2P data sharing software will help you easily share files online. Most of these p2p file software will let you download both legal and illegal content, so be very careful about what you download. Furthermore, there is also a chance of malware distribution via these p2p file sharing software, so it is best to check all the files with your PCs antivirus program to ensure they are safe. Next: Find Snapchat Friends – How To Find Friends on Snapchat?